iPod/Apple public art parody from Melrose Ave.
Hey folks. Just got back from a trip to N. Hollywood. While walking down Melrose Ave., I noticed this parody/critique on Apple. I thought you might get a kick out of it. Sorry for the lo-rezness of the image. 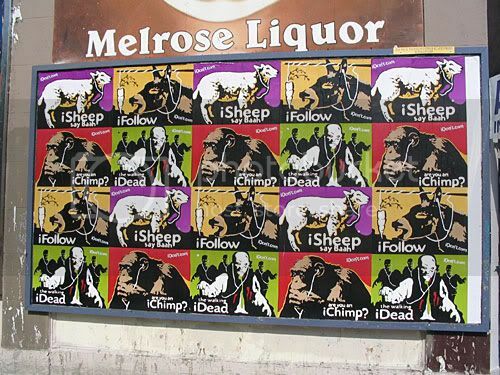 some of the hard to read text reads, "The walking iDead" "Are you an iChimp" "iSheep say Baah"
ps: For all I know this is an ad from an Apple competitor. If you have more info. about this, please post. Yeah, those are the posters offered for sale at the "iDon't" site. SanDisk, attempting to drive a viral marketing campaign of iPod backlash wherein "thinking for yourself" = "buying a SanDisk MP3 player". iSee one of the least successful ad campaigns in the history of advertising. They should have learned from Apple's Lemmings ads.